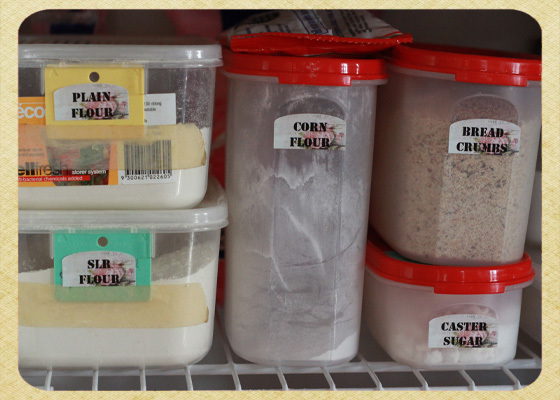 Labeled Goodness... hehehe I went a bit crazy in the pantry! 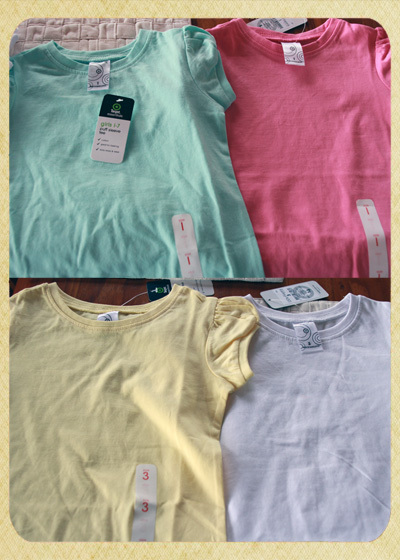 Printed T-Shirts - Take Two! As promised I got my hands on some Silhouette printable heat transfer material for DARK colored fabric... and WOW I LOVE IT! Once again read the back of the pack before printing as this time round the image doesn't have to be reversed (good job I checked the pack before printing...lol). I did change my printer settings to select a different type of paper other than plain but not sure this was necessary. The only other item I really needed for this project was the Silhouette lifting tool to remove the cut transfer from the backing paper. The transfer paper is sturdy enough but as I am a little impatient the tool made me slowly peel the image off...hahahaha. 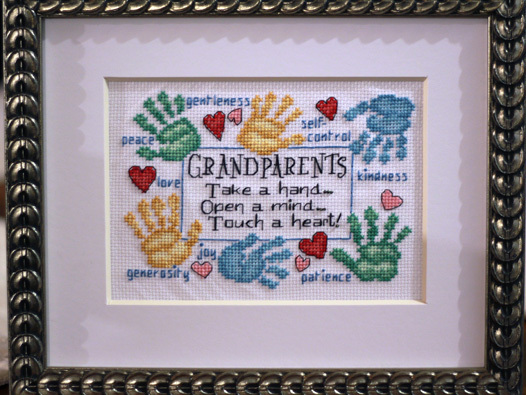 Isn't the image adorable... the words are from Maryfran's (NitWit) Waddles & Whimsy Too kit and the little duck is from her Waddles & Whimsy kit. Card Me Thursday - Geared Up! It's that time of the week again... yep it's Thursday! 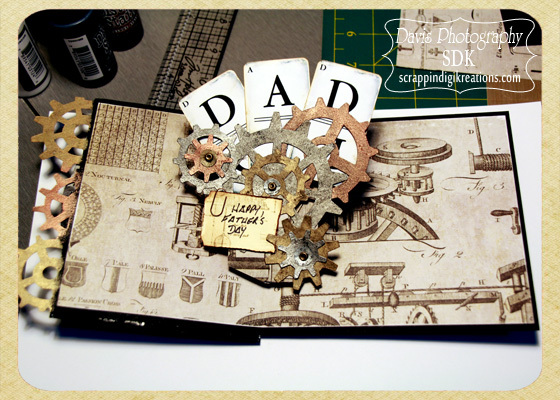 My card this week is a little something I'm whipping up for my Dad and Dad In-Law for Father's Day in September. 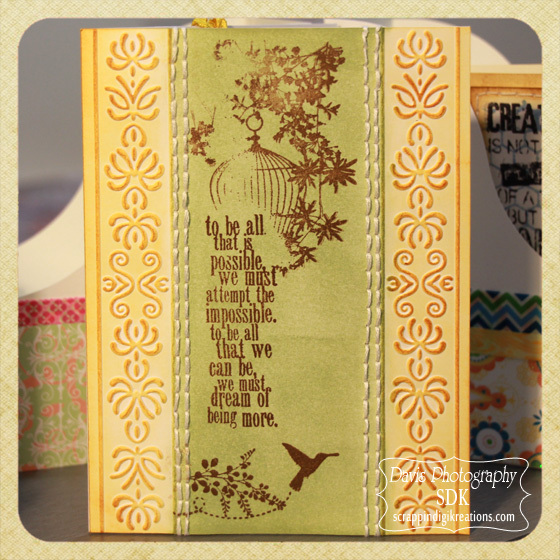 My card is fashioned after a card Shelly Hickox made for the Sizzix Blog ...seriously go check it out, this card is so cool! I just can't get enough of the pop up action when you open the card...lol! 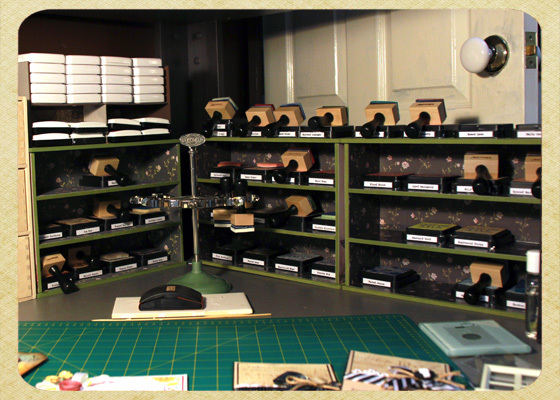 Get it Sorted - Mini Magazine Holders! Despite having a cold for the past week and going away for two days on a work conference the week before, I have been really productive... hmmmm I'm sure I don't have to be sick or go away to be productive...lol! 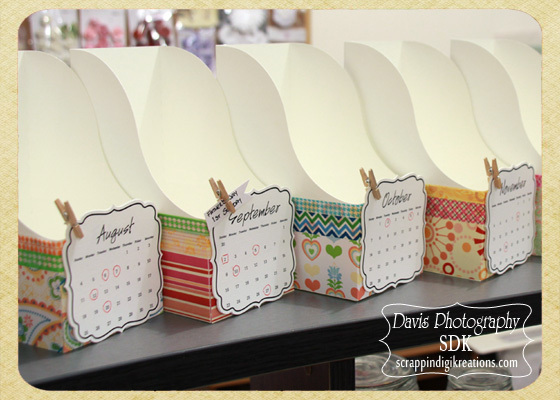 The lower part of the holders are wrapped with various scrapbook papers and two rows of washi tape add around the top. The Calendar labels were also cut with the Cameo, I then circled the dates of importance with a red pen. 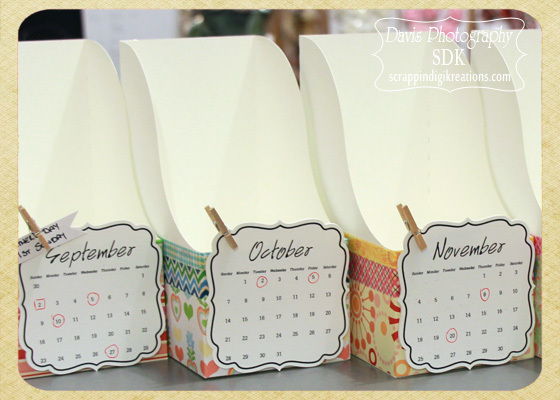 The little pegs in the corner hold two calendar months together and I can also use them to hold notes for a particular month, like the one for September - Father's Day 1st Sunday... well it is here in Australia anyway! How is your Thursday tracking? I love Thursday's as it is the last working day of the week for me...yippee! My card today had me doing a bit of a yippee too... 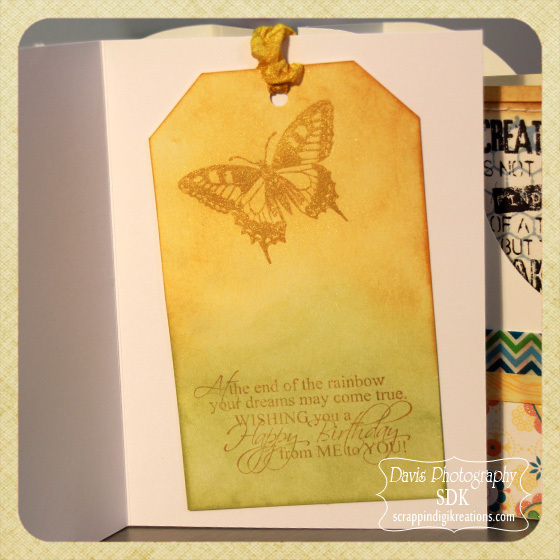 I love the colours, I love the textures and I love the stamping! The card front was embossed with one of the new embossing folders from Couture Creations - Romantique Collection: Pastorale, which was then inked over with Wild Honey and Bundled Sage Distressed Ink. I then stitched twin rows of floss inside the embossing, using the We R Memory Keepers Sew Easy Stitcher. Using Ranger Archival Ink: Coffee, I stamped several images in the center. 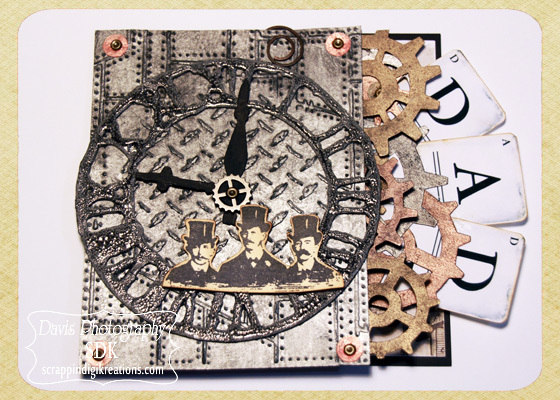 I attended a Make & Take Demo with my local Kaszazz Consultant - Julie, she was demonstrating a couple of Tim Holtz techniques learnt at a workshop in Melbourne when Tim visited Australia recently. Not only was it a fun night with lots of ladies attending, I came home with four gorgeous tags - thank you Julie! Only problem was I didn't want the tags to just be thrown in a box as they are soooo nice, so I figured they would make great bookmarks and what better way to give them... include them in a card. The tag (this one was my favourite) was inspiration for the front of the card. Perfect Pearls were used to give the awesome Kaszazz stamps a beautiful gold shimmery finish, that you can just see in the photo :) Again Distressed Inks Wild Honey and Bundled Sage were used on the tag which I then heated to dry the inks. I used Wild Honey as the ink for the stamps and then Perfect Pearls were applied on top. So very happy with the inside and out side of this card! 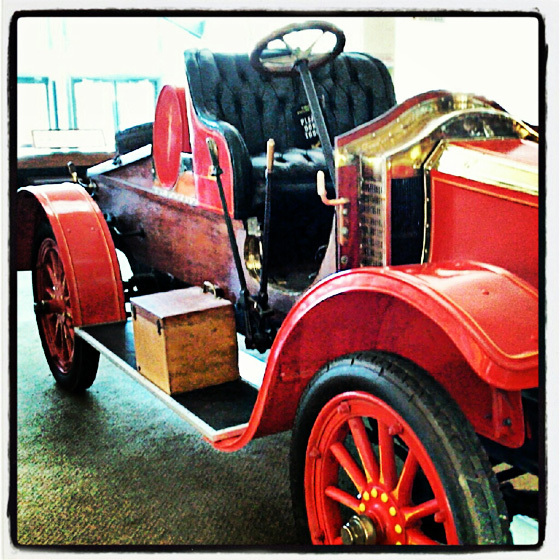 Wordless Wednesday - Old Cars! 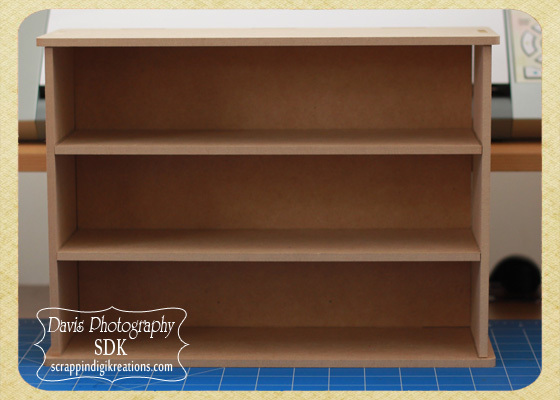 You know there are some weeks when I feel like I have achieved nothing in my craft room and others where it all comes together and I get so many projects finished at once... hmmmm maybe I should just work on one project at a time but seriously where's the fun in that...lol. As you can see each unit holds 12 ink pads with room for 4 more on top and to keep my OCDs happy each pad is labeled and they are lined up according to the Ranger Ink - Distressed Ink Pad Colour Chart...lol. 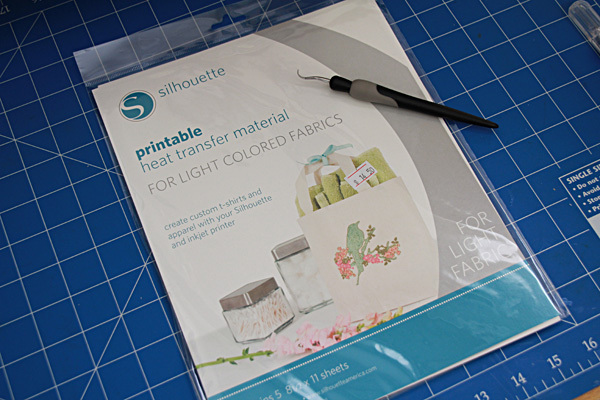 I saw Silhouette had bought out a Printable Iron-on Heat Transfer paper and as I have been feeling like a very slack Grandma having not made anything for my little granddaughters, I thought hey this could be a fun, quick and easy project. Made even quicker as my Cameo can cut out the images too. 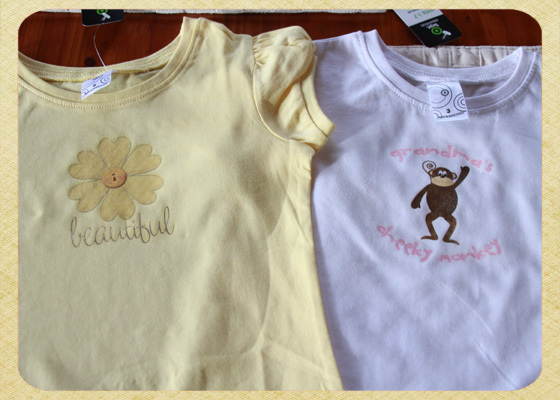 So off to the shops I went and picked up these cute little tops for the girls for Summer (it's Winter here at the moment). Nothing flash, nothing fancy, just plain, inexpensive play tops. Then the fun began... I figured I could use graphic images to make up some cute iron-ons from the numerous digital kits I have just sitting on my hard drive. Now all my layout designing was done in the Silhouette Studio but you could just as easily do this in photoshop. Things to note if you are using the Cameo: 1. don't forget to mirror the image so it's backwards. As I actually wanted a border around all my images, I found it easier to do the border and then group everything together before mirroring the image. 2. 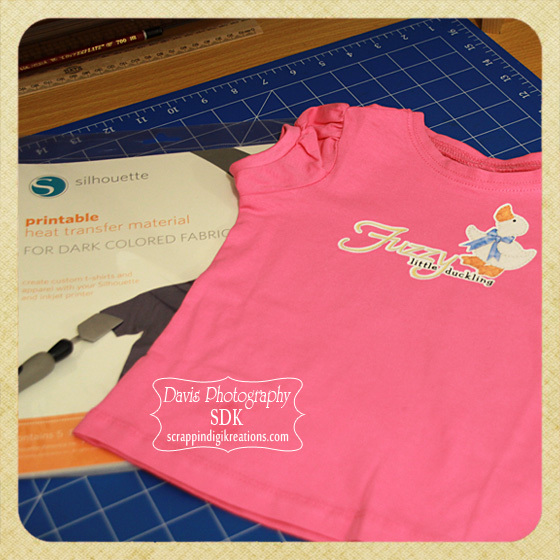 Make sure you have the correct page settings in Silhouette Studio, I didn't and printed my images then realized I had the Cutting Mat set to 12x12 instead of none :( This made a difference to the position of registration marks and the images on the cutting mat. 3. Read the instructions on the back of the pack several times...nuf said! I printed out the design on my Epson, the only sticking point here was what paper type setting to use. I went with plain paper but next time I may try a setting that will put more ink on the page, I like a nice, dark, crisp image. 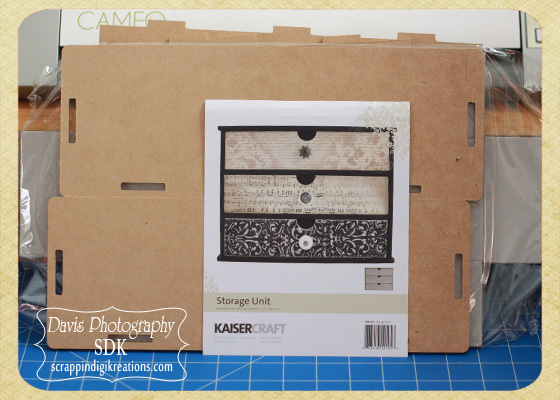 I cut the images with the Cameo and then following the instructions I removed the part of the transfer not needed. Don't have a Cameo, don't worry just cut the images freehand. I must say I was very surprised by how thin the transfer paper was, hurrah no more thick plastic transfers! 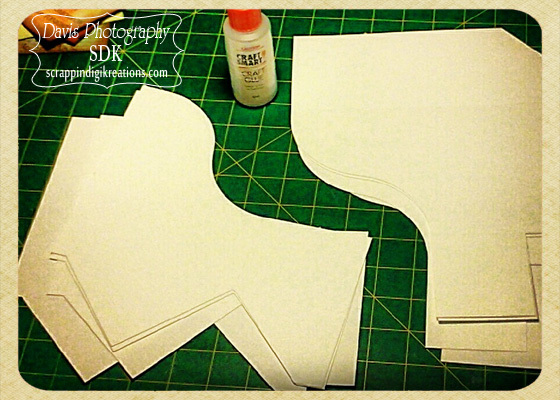 I used the Printable Iron-on for light fabric, and yeah it really is for light fabric! As white is not a colour anything white on your image will take on the colour of the shirt. 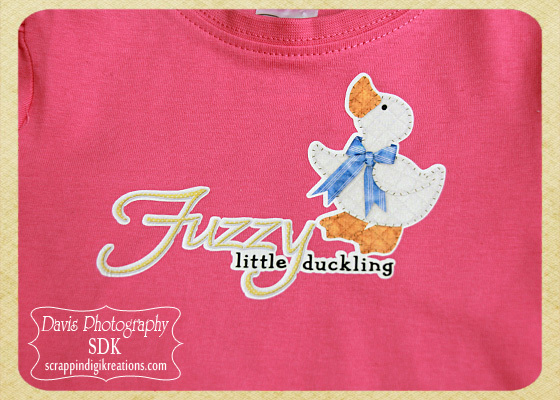 I didn't end up doing the pink shirt as I had a cute little white duck image for the iron-on... pink ducks really don't do it for me, lol! I did find I had to iron the printables several times in some spots to get a good transfer, but that may just have been my lame ironing skills...hahaha. The shirts cost me $4.00ea (AU) and the printed transfer worked out to 75c ea, howz that for a cheap personalized gift :) I love how the shirts turned out and will definately do more of these. 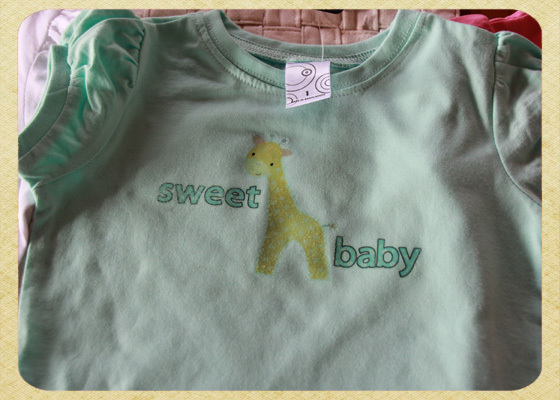 Next time I will try the Heat Transfer Paper for Dark Fabrics and see how we go with that. 1. 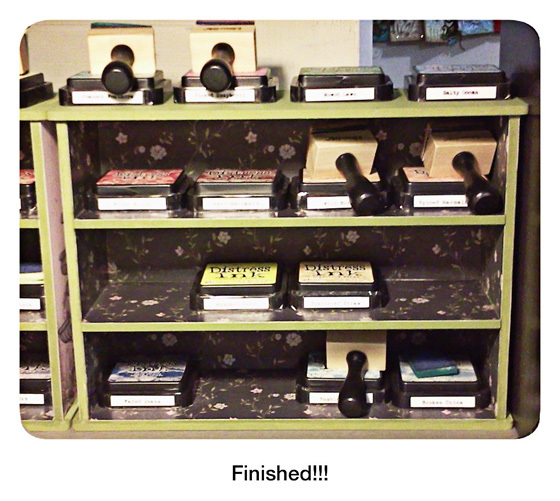 My stampamajig... how did I ever line up stamps before now. No really... for me stamping was always a bit of hit and miss, with the invention of unmounted stamps it was really more miss then hit...hehehe. Not anymore thanks to this very ingenious tool that will line up your stamp placement perfectly. 2. My Xyron... I often feel like I have man hands when trying to apply glue to small or fiddly little embellishments. Not anymore thanks to my 1.5' xyron, you put the fiddly embelly in the top and pull the thing at the bottom and ta da... a sticky embellishment ready to put on your project. 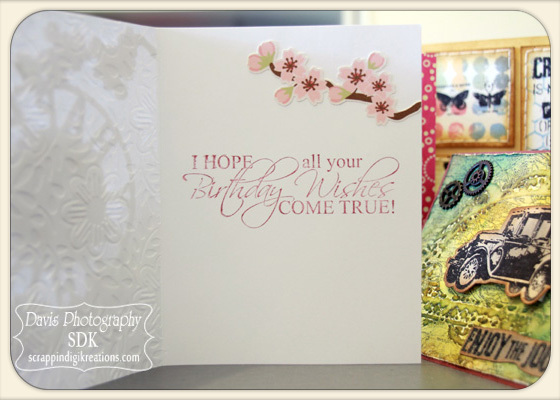 I took a white card and ran it through my big shot with the M-Bossabilities 'Garden Delight' embossing folder. Using the Silhouette software and print and cut feature, I printed three cherry blossom branches (two slightly small than the other) and the coloured no.50 on my Epson printer. I then cut both of those and the happy birthday circle and a slightly larger no.50 with the Cameo. I ran the coloured no.50 through my xyron and stuck this to the larger no.50. 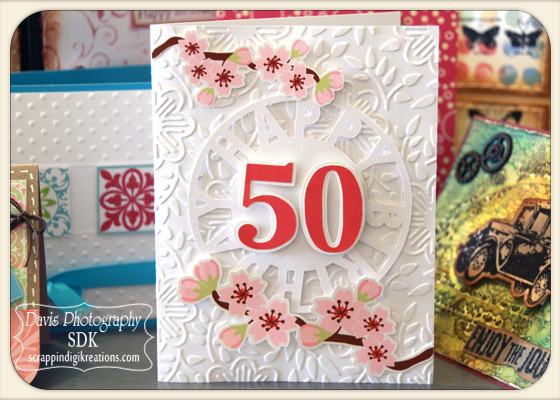 Using foam squares I then stuck the no.50 to the circle and the circle to the front of the card. The cherry blossoms have foam squares under the buds at one end and just glue at the branch end. I used the stampamajig and a Kaszazz stamp for the sentiment and attached a second small cherry blossom branch to the top of the inside. Again I ran the branch through the xyron, peel and stick = done. A very simple but sweet card I made for my Sister-in-Laws 50th! I used a top fold yellow card for my base. Then using my Silhouette I cut the hexagons and frame. 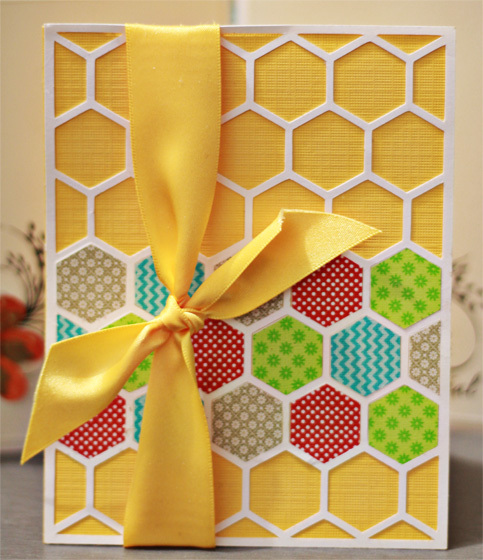 This was where Nichole's planner was invaluable for placing the coloured hexagons. I glued everything down and added a ribbon - card complete!